Editor's Note: This is the second post in a three-part series from Dave's trip to the Bolivian Salt Flats. Read part one here. 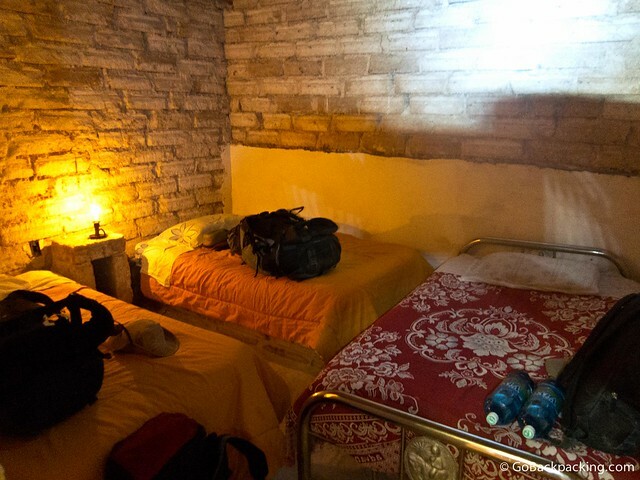 I woke up a little after midnight to a pitch black room in the middle of the Bolivian Altiplano. My fingertips hurt. All 10 of them, and all to an equal degree. “This is new,” I thought. Of all the altitude sickness symptoms I'd read about over the years, painful fingertips was never mentioned. I mentally checked in with the rest of my body, from the tip of my toes to the top of my head. I spent the rest of the night pushing my thumbnails against alternating fingertips on each hand to make sure I still had sensation. The pain itself wasn't too bad, but losing feeling altogether would be a bigger problem. I barely got another hour of sleep, and looked forward to the moment the sun began to bask us in its light and warmth again. We sat down to breakfast around 7AM, and promptly shared notes on how everyone slept. Quite well, it turned out. When I mentioned concern for the pain in my fingers, two of the young British backpackers brushed it off, saying it's normal and they'd experienced the same thing while climbing Mt. Kilimanjaro. There was nothing for me to do but try to take comfort in their response. We weren't going to reach Uyuni any faster than the itinerary suggested. Leaving the lodge a few minutes after 8 AM, it took less than an hour to arrive at our first stop of the day. 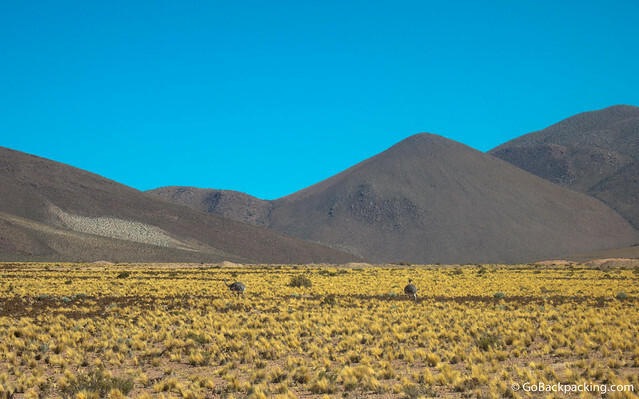 The Siloli Desert, one of the driest places in the world, features a rocky outcropping with one formation in particular getting all the attention. 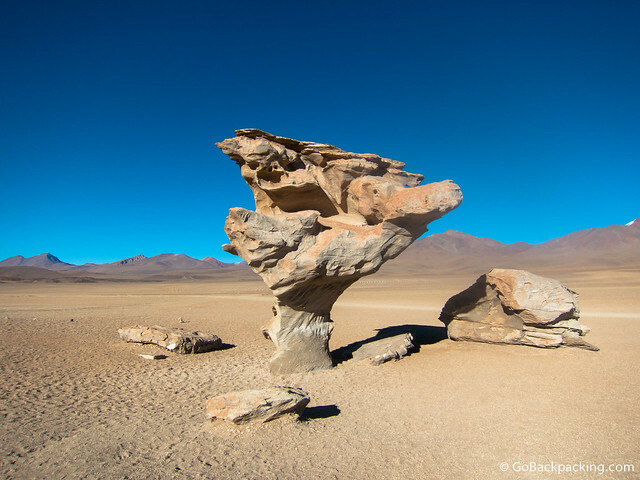 The Árbol de Piedra, or “Stone Tree” has the naturally sculpted qualities of a tree, which is fascinating given the location. It's a testament to the power of high winds, sand and water to erode solid rock if given enough time. 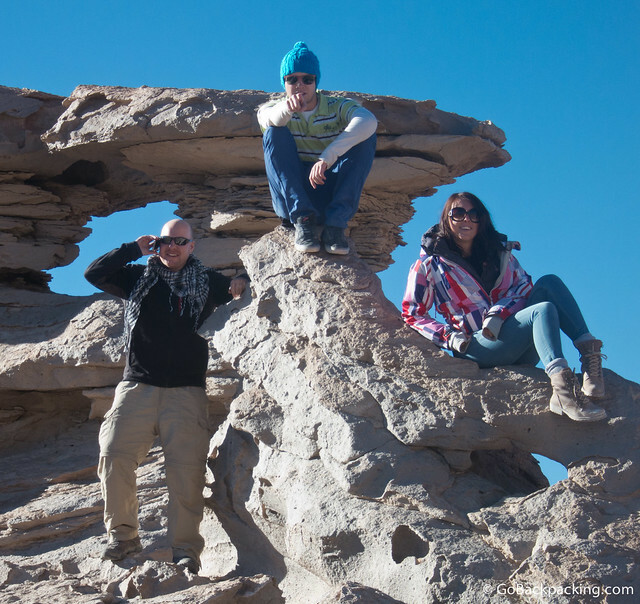 Once we all took our photos of the Stone Tree, it was time to climb around on the other rocks in the area. I had to hand it to the British backpackers, they had some funny poses in their repertoire. I never would've thought to do a “boy band” pose, but the location turned out to be perfect. A twenty minute drive from the Stone Tree was another rocky outcropping. Pedro, our driver, said it was a good place to spot Viscachas, small rodents related to chinchillas, with an appearance similar to rabbits. 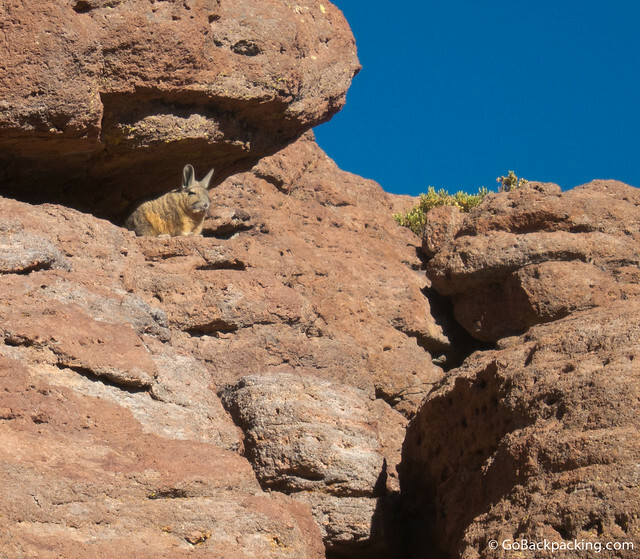 Sure enough, when we rolled up alongside the rocks, he was able to spot one perched above us, peering out into the great expanse. His fluffy orange and grey coat camouflaged him well, and looked appropriate given the low temperatures that befall the Bolivian Altiplano every night. Pedro tossed him a piece of food, which he held in his front paws and nibbled. I know it's not ideal to train local wildlife to anticipate food from humans, but I was glad I had the chance to see the little guy, and I suspect most other tourists are too. Another hour of driving across the desert lead us to more flamingo-filled lagoons. 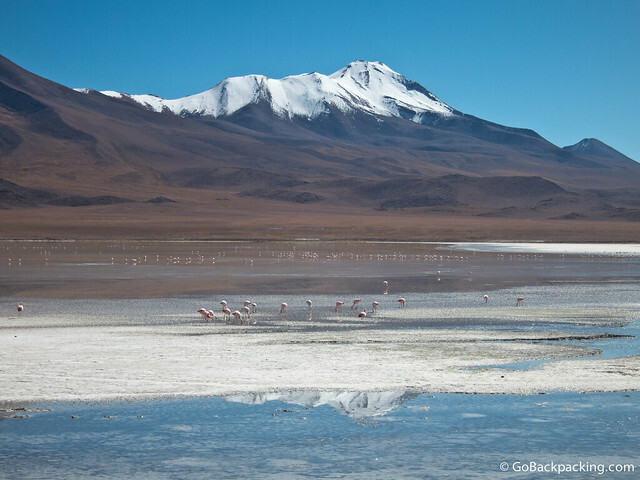 Located at an elevation of 4,121m (13,520ft), Hedionda Lake was dotted with hundreds of white and pink flamingos feeding on algae in the water. 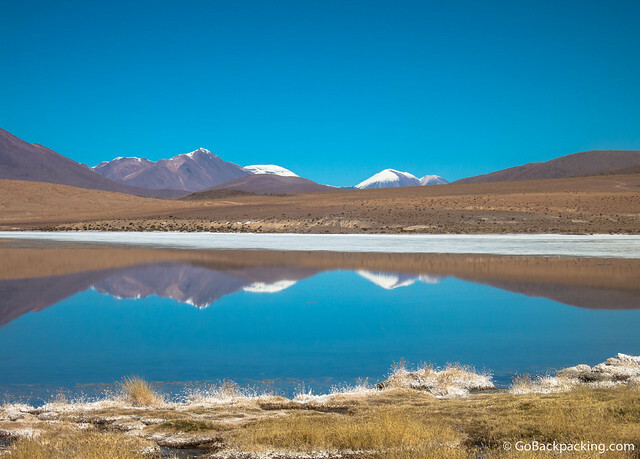 More impressive to me was the crystal clear reflections in nearby Laguna Cañapa. 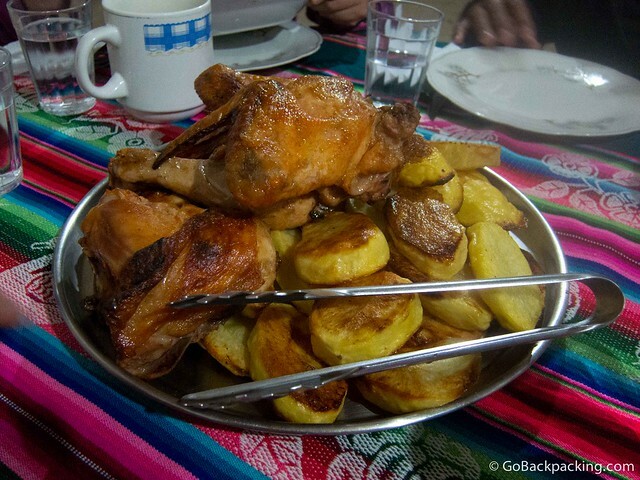 This is also where we stopped for lunch a little before Noon, with Pedro preparing a mix of canned tuna and potatoes, corn, rice and a fresh cucumber and tomato salad (with pieces of white cheese thrown on top). The sunlight, food and copious amounts of bottled water I'd been drinking had so far done little to reduce the pain in my fingertips. I continued to press my thumbnails into them from time to time, and tried to focus on the sublime scenery surrounding us. It was another hour's drive to reach the lookout point for Volcán Ollagüe. 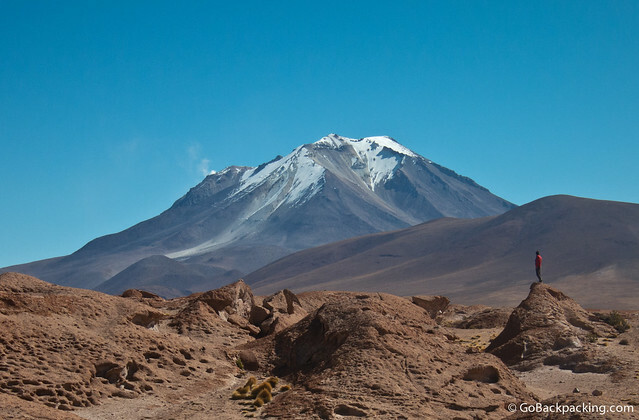 At 5,868m (19,252ft), the volcano towers over the surrounding area. “Active sulfur mines on the upper western and southern flanks of Ollagüe are reached by a road that climbs to about 5,500m elevation. From the volcano, we drove another hour and a half to a small town where we had to stop for some reason (I can't remember why), before heading to our accommodation for the night. At 4:30 PM, we arrived on schedule at the The Hotel de Sal (“Salt Hotel”) at the edge of the Salar de Uyuni, the world's largest salt flats. Pedro went inside while we all waited in the SUV. When he returned, it was to say there was no space available. Do they not make reservations at these places? For a moment, I felt disappointed. Where else in the world would I have the chance to stay in a building made entirely of salt bricks? 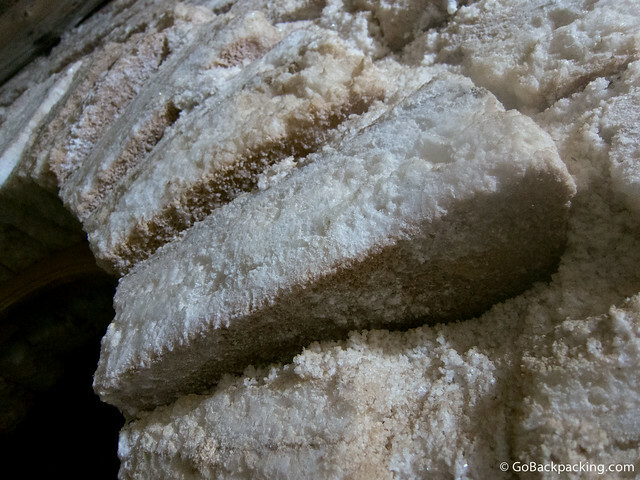 Luckily for us, Pedro's mother owned her own salt hotel, and it was no more than 100 meters away. The salt hotel trend began in the mid-90's after the first one was built on the salt flats. Now, it appeared, they were a dime a dozen. Entering the hotel, there was no mistaking it was made of salt. And lots of it. Even the floors in our bedroom were covered in it. The six of us were offered two rooms. They were cramped but sufficient. We dropped our bags, and began to unwind. Dinner consisted of vegetable soup with bread, and a heaping pile of chicken. There was electricity in the evening to recharge our batteries, but not much else to do besides play some cards and head to bed early. My fingertips still hurt, but they were no worse than when it began almost 24 hours earlier. We were sleeping 900m lower in elevation than the first night, and I hoped that would help relieve whatever was going on with my body. The next morning would be an early one. The plan was to pack up the SUV and leave the hotel at 5:30 AM in order to allow us enough time to drive out onto the salt flats to watch the sunrise. It sounded simple enough. Pedro has been leading these trips for nine years. We were staying at his mom's hotel. The salt flats were his backyard. Our third and final day would be a slam dunk of awesomeness. But this is Bolivia, and what happened next would test us all, in more ways than one. Great photos Dave. That landscape is unreal. Can’t waiit to read about Day 3! It was my favourite day of the tour, starting with sunrise overlooking the salt flats. Interested to hear what the test was, hope it wasn’t car trouble! Wow, love the first photo in your post! Altitude sickness kinda scares me, but all the awesome things you did and saw makes me want to do this trip more than before! Me too, but it was very worth it! The best thing you can do to minimize the effects is give yourself enough time to acclimatize before getting started. It’s easier to do this if you begin in Uyuni, because wherever else you came from in Bolivia is probably at least as high, if not higher. 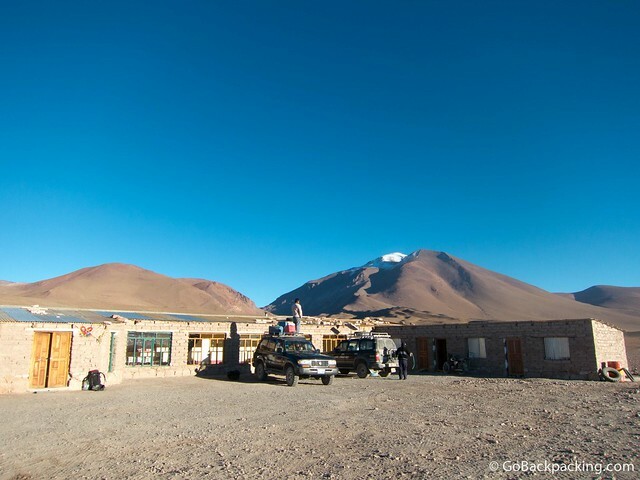 For example, the nearest big city to Uyuni is Potosi at 4,000 meters! If you do the trip from San Pedro in Chile, you’re more likely to feel side effects. But, because you’re driving almost the whole time, and not walking or hiking more than a few dozen meters to take photos, it’s not too strenuous. Great post. You convinced me to add Bolivia to my bucket list. I am curious and I think I know the answer. How was the Internet out there in the salts? Great post! When is part 3 coming out? 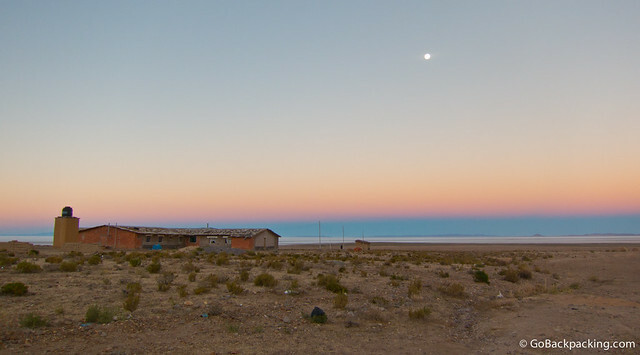 I’m heading to Uyuni in a few weeks! !